Here, "Cosmos" delivers another episode packed with information about astronomy, history, geology, and science in general. A brief preamble concerning sudden cataclysmic disruptions to long-term environmental bliss leads into the great mystery of the Tunguska event of 1908. The initial mystery of Tunguska is brought to life better in this episode than in most other documentaries that touch on the subject, in part because it seems that "Cosmos" managed to get hold of actual black-and-white film footage of Soviet scientist L.A. Kulik and his team as they traveled to, surveyed, and examined the impact site in Tunguska, Russia. 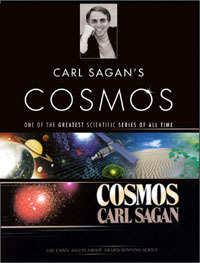 With a bit of clever editing between this, some special effects graphics, and footage of host Carl Sagan in a similar-looking burnt-out forest, "Cosmos" generates an unmatched illusion of having taken its audience right to that time and place, and via its musical choices into that culture, to witness the event. But what happened in Tunguska? What kind of astronomical impact causes an explosion, and fire, and flattens trees, but leaves no crater and no meteorite fragments? Sagan recounts several proposed theories that don't quite match the evidence before settling on the most likely answer of a comet. All great. But while "Cosmos" here presents the definitive introduction to this event, the answer doesn't totally satisfy until fleshed out much more fully in the third season episode of The Universe entitled "Deadly Comets and Meteors". In that, we get to witness scientific computer simulations of the event, compared with and enhanced by data from the Shoemaker-Levy 9 impacts on Jupiter, which demonstrate how a comet made mostly of ice can explode due to high-speed friction from our atmosphere just before actually hitting the ground. Of course, in 1980 when Cosmos was made, Jupiter had not yet been hit by Shoemaker-Levy 9, so Sagan and company really did do the best they could at the time. Still, it's nice to see a good companion documentary like the one described above to get a fuller, more rounded payoff to the question of there being no impact crater. "Cosmos" continues with its major examination of comets next, while continuing its main theme that science and observation slowly but surely triumphed over superstition. Sagan takes his share of digs at superstition here, but does not go as far as in the previous episode, and remains tasteful about it by and large. The best highlight of the Comet section is the very graphic "computer study" which demonstrates a comet's orbit, and how it might change during gravitational interaction with other planets in our solar system. One of the best parts of the episode. Next comes a section that is more generally about collisions and impacts between pretty much any celestial bodies that might be found in our solar system. Though mention is made of Mercury, Mars and its moon Phobos, and Jupiter's moons Callisto and Amalthea, with an unlabeled photo of Ganymede thrown in for good measure, it is Earth's own Moon that receives all the big stories here. We get extensive historical and special effects recreation of an impact that was observed and reported by Canterbury monks in 1178 A.D., plus good coverage of the special mirrors placed by modern moon-landing astronauts and the Earthly set-ups to bounce lasers off of those mirrors, which apparently corroborate the large moon impact. This leads into a good section that attempts to detail the formation and geological history of the moon so far. Of course, the Theia impact theory had not been put forth as of 1980, so this ends up being an interesting alternative. "Science is a Self-Correcting Process"
One of the most precious balancing comments of the entire 1980 series comes next, as Sagan recounts, and largely disproves, a theory of how Jupiter might have created Venus, triggering some all-too-recent biblical "miracles" along the way. Yes, it was pretty ridiculous, and deserved the debunking it got. But Sagan's real reprimand is for the scientists of the day, citing their attempts to suppress the theory as being of the same bad form as many religions in the past. New ideas should be expressed freely and be tested by science, according to Sagan, because you never know when that new idea might revolutionize everything. A surprising, but very, very welcome bit, and another great highlight of this episode. The next section is, for me, the main attraction of the episode. Here, time is taken to really look at and explore Venus, once thought to be the most attractive planet in the solar system after the Earth. It has nearly the same size and gravity, and a similar orbit where it would be warm. But as this episode amply shows, its attractiveness was based largely on an absence of useful data, while eager Human imagination was too quick to fill in the gaps. Introduced here in the series is the concept of spectrographic analysis, which gave us our first clue that Venus may not have such an idyllic composition as we had at first hoped. Radioastronomy is also shown to have given us our next batch of good data, but the truly definitive highlight is the coverage "Cosmos" gives to the Soviet Venera Landers, including their place in history as the first man-made objects to touch down on another planet. We see some of their early photos taken on the surface, and get some suitable model recreations with heat-shimmer. As Sagan follows their trajectory in his Ship of the Imagination, the dense yellow stormy clouds of Venus make a very strong special-effects impression. Again, this is a very compelling and indulgent recreation of an alien setting. We come away feeling like we've been there, and that we understand fundamentally why it's so different and strange. "A Little Greenhouse Effect is a Good Thing." After only about 10 minutes of real focus on Venus, "Cosmos" allows a comparison with Earth and our ideal environment to take over the episode. Sagan's visit to the Sphinx in Egypt becomes his backdrop to the concept of erosion, which can be greatly accelerated by pollution. The ultimate take-away from this bit may be the insistence that change is the only real constant in the universe, and that it persists throughout the cosmos. Nowhere is static and unchanging. Visually, a lot of the ugliness of our civilization gets screen time in the final section here, a trigger for us to question why we don't do a better job of cleaning up our act. A fair question. Curiously, there is a balance here which nearly flies under the radar and goes unnoticed. The abundant portions dealing with runaway greenhouse effects causing global warming, as seen taken to the extreme on Venus, may easily be the primary lasting impressions of the episode. But we should also note that, perhaps expressed less eloquently, Mars is also mentioned in contrast to our Earthly ideal environment, with the warning that Human activity such as de-forestation brings the danger of leaving "light" coloured bare patches on Earth, reflecting more sunlight into space instead of absorbing it, which cools us down.... "Might this also make an ice age here?" Sagan asks. Perhaps it is better not to walk around simply repeating mantras like "global warming" or even "climate change" with blind passion, but rather as this episode prompts, to be truly AWARE of all that is going on on our planet and society - environmentally, economically, and politically. That partly sets us up for our response to episode 13, but to be fair, the political and economic aspects of this are really beyond the scope of "Cosmos". Episode 4 has kept itself interesting by focusing predominantly on science and astronomical phenomena. The only real key it can comment on here is the need for BALANCE, which requires us to keenly observe how and in which directions we may have gone or may be going out of balance in the first place. And so, a decent episode of "Cosmos" comes to an end. While there are a lot of good highlights that I enjoy, there are a number of other bits that are either just average, or are not presented with enough careful depth to reveal those aspects of the issues that really would trigger people to make the kind of changes required to finally transcend and conquer those issues. It chips away at beginning the process of awareness, while remaining frustratingly behind-the-times in terms of identifying some of the real roots of the problems. "Cosmos" has other, cleaner, more interesting episodes, although this one is certainly not bad at all. Read the data capsule review for the next episode: "Blues for a Red Planet"